At Toolcraft Rental our Mission is to give Quality Service and the finest Equipment to our customers. To provide the right choice for the job - every time. Our knowledgeable staff will take the time to help you choose a appropriate, quality, well-maintained piece of equipment. We will help you make sure it fits the job you're trying to accomplish and insure your rental is in perfect working order. And, of course, we always demonstrate how to use your rental before you leave. We want every Rental to be Safe and Successful! We are an Authorized Dealer for Echo® Groundskeeping Equipment, Dolmar® Chain Saws, Generac® Generators, Koshin® Pumps and sell Used and Refurbished Lawn Mowers and Power Equipment. We maintain a Complete and Highly-Trained Service Department providing Factory-Authorized Repairs to many Small Engine Makes including Briggs and Stratton®, Tecumseh®, Kohler®, Honda®, Kawasaki®, Wisconsin-Robin®, Echo®, Lawn Boy®, and Toro®. We are also a 35 Year ARA® American Rental Association Member. 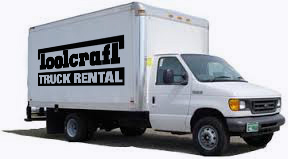 We are your Local Source for Box Truck Rentals! Our 10’ to 24’ Box Trucks feature Power Lift-Gates at the best Rates in Central Vermont!